If chandeliers were a love language, it would be the one I speak most fluently. I love chandeliers and gravitate towards them (going so far as to book exotic vacation rentals primarily based on the coolness of the chandelier in the suite!). At one point, nearly every room (including bathrooms) at Hawk Hill included a chandelier. I used to think chandeliers were limited to being placed only within reach of an electrical box- but when a friend asked for help hosting an evening bridal shower under the canopy of Hawk Hill’s ancient Live Oak, I started exploring how to make chandeliers a part of the outdoor lighting at my friend’s special event. Many pestering questions to the knowledgeable staff at my local hardware store led me to find out that its a just 5-minute job, once you get the hang of it, to convert a light fixture from needing to be hardwired to an electrical box to simply plugging into any outlet. And you just need one, really cheap part! 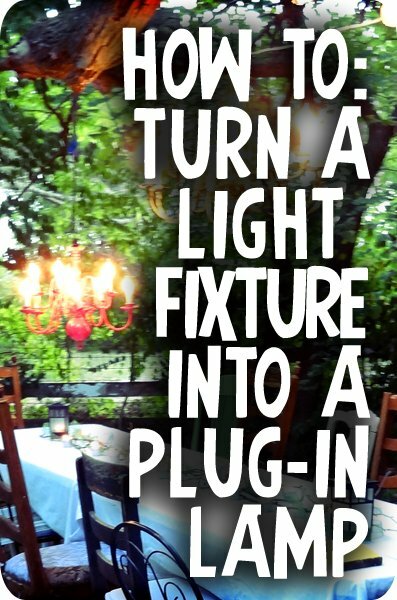 This invites all sorts of fun- once the plug is added a chandelier can go anywhere an extension cord can. Here’s an illustrated tutorial on how to add a plug to a hardwired light fixture. Straight Blade Two Pole Three Wire (aka, grounded 3 prong plug) for about $1 more. CAUTION: If at any point these instructions seem unclear or don’t adequately address the particularities of your light fixture, stop and consult an electrician or otherwise qualified individual. Electricity is dangerous, ya’ll! First, choose your light fixture. 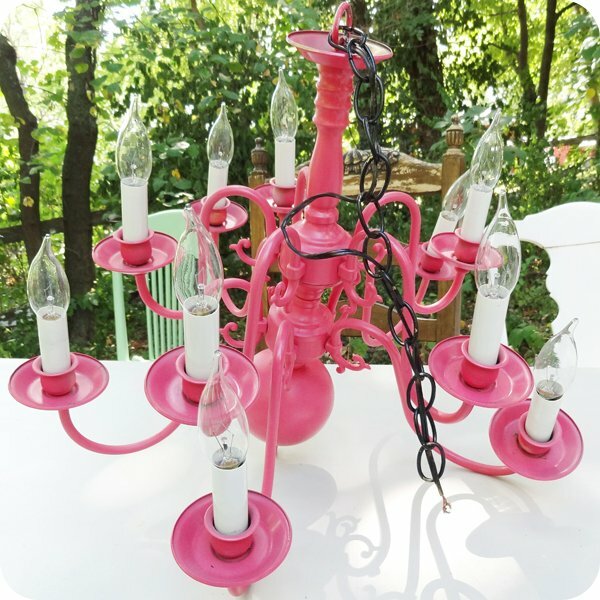 Thrift store chandeliers paired with a new coat of spray paint make great pieces to experiment with and are ideal temporary lighting to use as decoration for parties, girl’s nights in, etc. 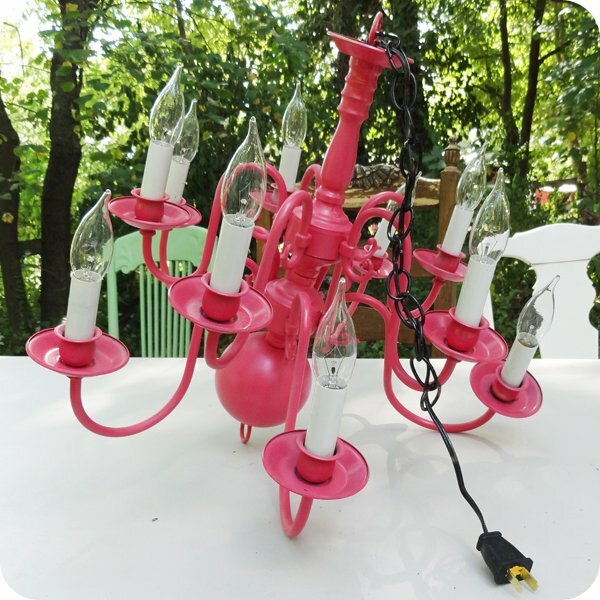 In this photo, a $15 ugly brass chandelier turned pink-party-accessory is ready to convert to a plug-in fixture for use as outdoor lighting at a bachelorette party. Separate the two wires that come out from the two separate sections of the cord. The plastic coating may fuse them together but to make the next step easier, you’ll want to pull a few inches apart. A new or used household light fixture should already have these wires exposed, but if they seem too short or frayed, you can strip the coating farther back and trim the frayed wires. Already exposed but a bit frayed, I chose to make the next steps easier by cutting and stripping the coating from a new section. Now firmly insert a screwdriver up through the base as shown. 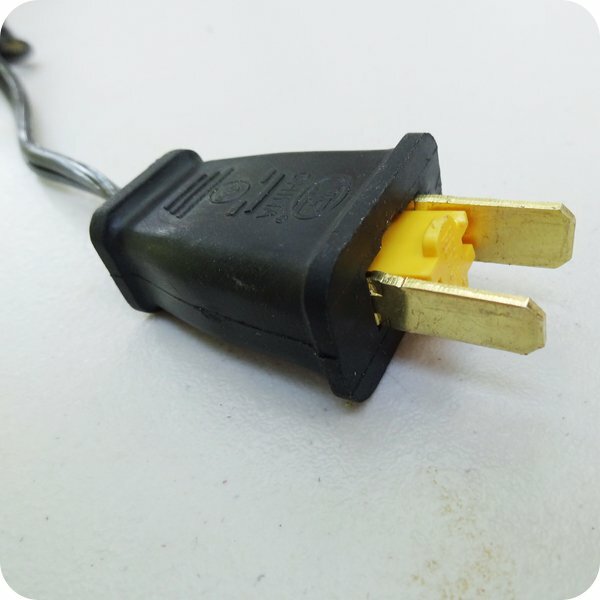 The yellow portion (stamped “remove”) will pop out, allowing access to the plug’s prongs. Once the yellow center portion is removed, the prongs will either pop out or come out with a gentle tug. You’ll notice each prong has a tiny screw which was hidden by the yellow plug. This screw will secure your light fixture’s wires to the prongs in order to conduct the electrical current. Loosen but do not remove these screws. In my dozen or so times repeating this process on chandeliers, I’ve forgotten this step more than a few times and had to repeat, so don’t skip: feed the light fixture’s wires up through the base of the plug and out the front. Push the plug down and out of the way, then attach your light fixture’s wires to the loosened screws as shown. Wind the wire in through the notch in the plug and snugly around the screw post. Tighten the screw to securely hold the wire. 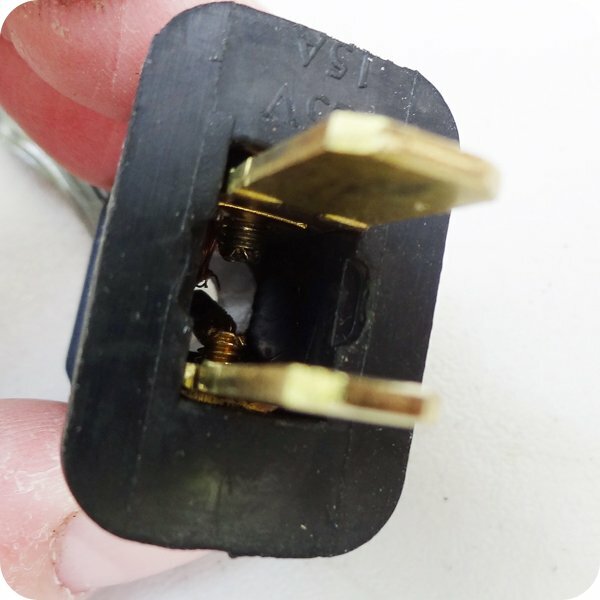 Next (and this part can be just a bit tricky) push your prongs back into the plug housing with the head of the screws facing outward. Seat the prongs snugly into each side as shown. It may help to use a pair of pliers to grip the prong and settle it snugly into place. Now, replace the center yellow portion (pushing it completely in, until the black and yellow fronts are flush). Once the yellow is fully in place, your new plugin light is ready to use as a lamp, swagged fixture, or portable light! This was such great info. I am a female and have done several easy DIY electrical jobs. This tutorial was so great. I tried to order the plugs from Ace hardware and they were all a 2 wwek wait,so I ordered thru Amazon. Same price. Item # at Amazon is Pass and Seymour SA540BKCC10. iT ARRIVED IN 2 DAYS. I NEVER CONVERTED A HARDWIRED ITEM INTO A PLUG IN BEFORE. THANKS FOR THIS WONDERFUL EXPLICIT AND SIMPLE INSTRUCTIONS. 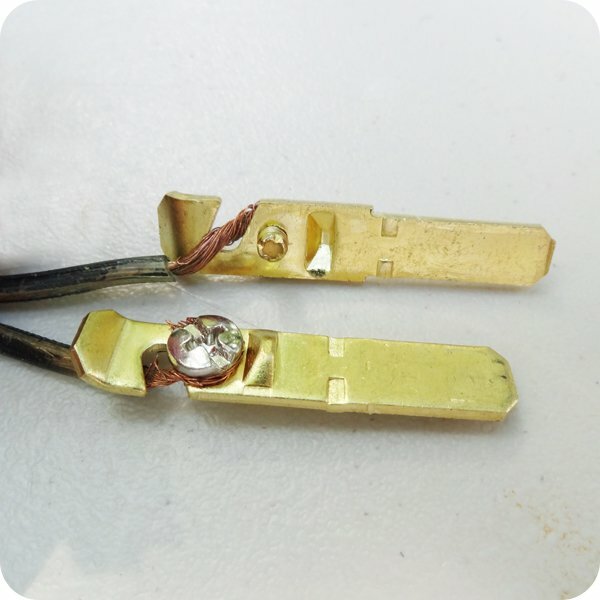 What do you do if there is a grounding wire to the lamp? Thanks! Thank you , Thank you, Thank you!!!! I knew it was doable but didn’t know how. Thank You for the information! Do you know how I would do it if I wanted to make the chord a lot longer? Do you have to splice wires together? Hi Kris- I have one in my living room that I needed a longer cord for. There’s two options- 1 would be to proceed with my instructions and then use an extension cord- the other would be to splice. 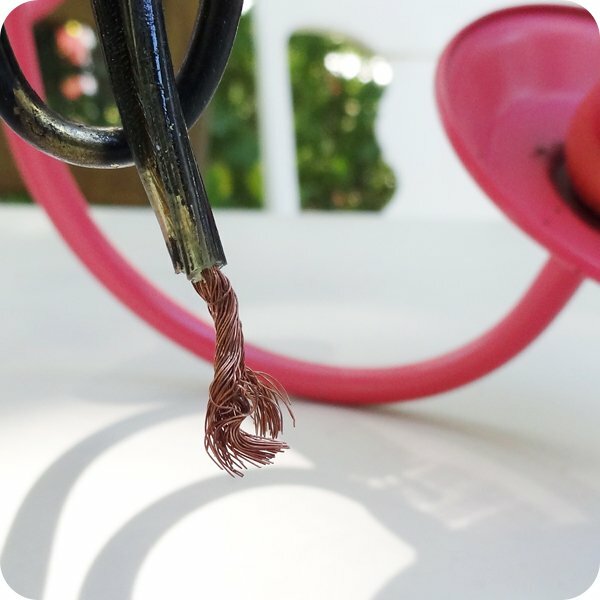 I spliced the cord of mine – Splicing actually is not hard at all- at the hardware store you can buy plastic tubes that shrink when heat is applied that make it much safer to get a secure splice with no shorts – take an extension cord and chop off the female end and join it to the existing wires on your light fixture. 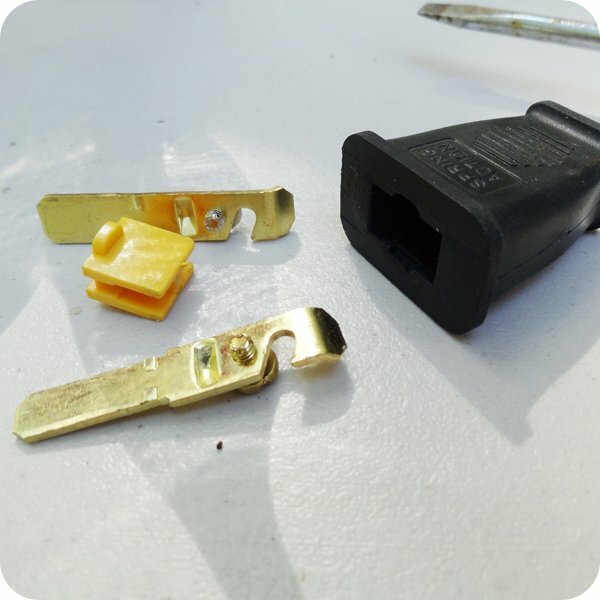 I’d suggest googling more about splicing and asking at the hardware store to be extra safe. i LOVE THIS! I knew this had to be possible, and I’m so excited. THANK YOU FOR SHARING, You ROCK!!!! Yesterday I bought a chandelier at a thrift shop I want to use outside. I asked the lady who sold it to me if she knew anything about converting it from hard wired to a plug. She looked at me like I had ten heads! I knew it could be done and now I know how! So excited! Thanks so much! Are you able to leave it outside in all weather conditions or do you have to keep it from getting wet? Thanks for your question, Nik! It’s DEFINITELY only for use in a dry area. We’ve used them for events outdoors on dry nights, but always bring them in afterwards. 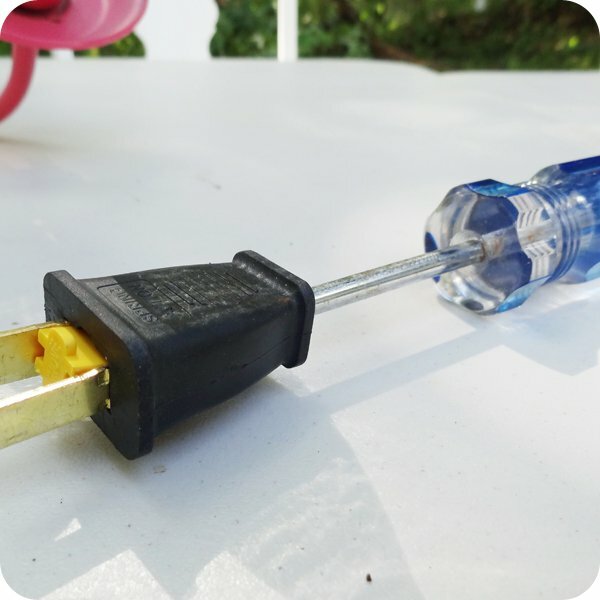 The exception might be if you did this to a fixture designed for outdoor use and put the plug in a waterproof extension cord box ( http://www.amazon.com/Farm-Innovators-CC-2-Connect-Water-Tight/dp/B002MHFXS8 ) and plugged the end of the extension cord in a GFCI outlet. Hi Lori! I was told it didn’t make a difference for a lamp, but if you are interested in learning a bit more, a quick google turned up this article: http://www.instructables.com/id/Simple-conversion-of-metal-lamp-to-use-touch-swi/step4/Identify-the-hotneutral-wires/ If you plan to use it often, to light a room for example, I’d go ahead and purchase the 3 prong plug just for peace of mind. Hanging from a ceiling is easy- just use a stud finder to find a ceiling stud and install a ceiling hook rated for a bit more than the weight of your chandelier. I have a chandelier from ikea (the kristaller) and it has 3 wires – a black, yellow, and white. is there a difference between these? which two would I attach to the prongs? Thanks for your question! Actually this one died a violent fate one day while transporting it to an event. The style, though, is easy to find at Habitat for Humanity ReStores and just takes a coat of paint to transform. Thank you for this tutorial. I picked up this exact same chandelier at goodwill a few months ago and painted it red. Originally it was meant to just replace an old fixture, but then I decided I more needed it in a spot where there is no light. Thanks again, this will prove to be very helpful! Thks Lindsayanne! I found an old chandelier imported from italy in a box that belonged to my parents. I was searching for a way to see if I could somehow connect the 2 wires to see if it even still worked before trying to hire someone to hang it for me. I think this might be the perfect solution! If it works THEN I’ll hire someone to hang it for me at the top of a staircase, that has 16 foot ceiling, adjacent to a window, which should look gorgeous from outside! If this works, I’m down the street from a great consignment shop AND a Habitat for Humanity ReStore to purchase some to use outside for some summer entertaining! oh! I’m so jealous! Would love to see it! Ok, so one of the guys at the hard ware store told me a VERY DANGEROUS way to check if a light fixture is functional (I have to say that, because it is! 😉 but it’s so quick!) You just take the light fixture, set it out in the middle of your driveway, for example, then run an extension cord to it that is NOT PLUGGED IN. Then, you take the two wires protruding from the light fixture and push one wire into each of the holes on the female end of the extension cord. Then back way up, and go plug in the male end of the extension cord. – if your light turns on you’re set! If it doesn’t, unplug everything, change light-bulbs, and try again. DEF worth a try & much easier! Will let you know how that works out (soon as it stops raining!) Thks! Pingback: Facing the Musik (the truth of an IKEA hack) | Joy Jumps Too! I am soo excited about this…but nervous. the chandlier I have has silver wires and copper wires….which is which? and also there is a third copper wire hanging out of it also…..what in the world do i with all that? haha i did find a 3 prong at lowes….but thinking of getting a 2 prong in stead! 3rd wire is the ground wire- which if you have, you should use, just for safety’s sake! I couldn’t tell you which wire is which, but it’s a safe bet if you have 2 of 1 color and 1 of the other color, the color with 1 wire is probably the ground wire. If you take it in to a local hardware store, one of their employees in the electrical sections should be able to tell you for sure! This is so exciting. I’ve become addicted to DIY projects and pinterest, Bought a chandelier at habitat for humanity and didn’t want to hard wire it. I’m putting it on my carport (covered obviously) for a little sitting area I created. Carport was a waste of space for just “cars” haha! Husband of course thinks I’m crazy but it’s okay 🙂 I’ve already caught him sitting out there just enjoying the scenery. Thanks for this amazing info! Hi so there are two sets of black and white wires, one set for the 3 lights on the left half of the fixture and one set for the 3 on the right, please help. Oh gosh, I’m not sure! I’m definitely not an electrician so can’t really give advice. Maybe take it in and check with the staff in the electrical section at the hardware store? The same instructions for how you’d hang a light like that would hold true for wiring it to the plug. Are these safe to use outdoors in the elements? Definitely NOT! However on my property I have hooks placed on low, reaching branches of an old tree, and a few chandeliers I used for extra light in the garage that I can pop up on those hooks and power with an extension cable with a 10 minute set up/take down time. If the weather is clear with no rain in the forecast they’re fine to place outside temporarily for an outdoor event. You just made my day Lindsayanne! I wish I would have googled this sooner. I am in a bidding war for a great chandelier at one of our local thrift stores and I think it will be mine. I intent to do just what you say and hang it over my night table. Thank you so much. What should I look for on the box to know of it’s hard wired or you have to plug it in when I purchase the light? Thank you, so much! 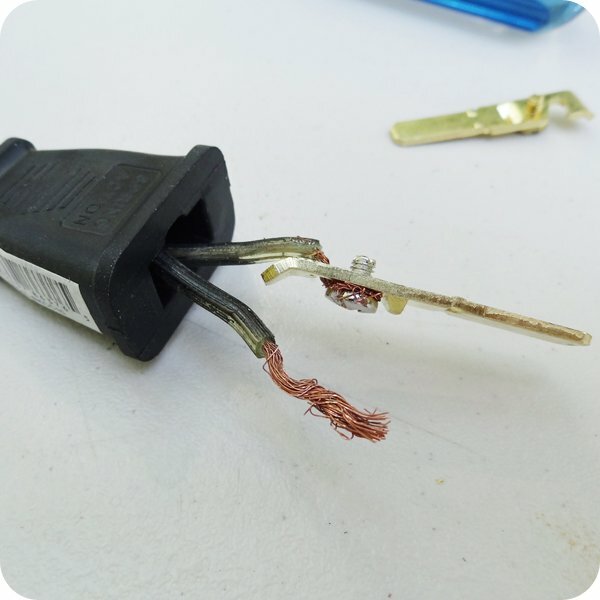 I have been looking for this information, for what seems approximately forever, because, I knew it could be done, but, all I could find, for the longest time, was instructions on how to turn a plug-in lamp into a hardwired one. There is a beautiful pendant lamp that I am so in love with, sold by Cost Plus, but, it is only sold to be hard wired and that would involve having to put it somewhere that would mean getting rid of or moving a ceiling fan, and, having it off center from where I want to put a table. Having it as a plug-in would make all that go away! Thank you, again and some more. I have a question I have a huge cathedral ceiling I am putting up a chandelier in the place of a hanging wicker basket ball light and I do not want to start from the very top of the ceiling I’m very short and I’m going to wire it from the bottom of the chain where I’month taking off the old one. Is this possible because looked it up so many different ways on Google and nobody has anything to stay on can you just change just from the fixture and not from the ceiling. I don’t want to put another chain up. First I could never get up there and I’m not going to hire someone cuz I can’t afford it. Now my brother to build his own home he’s a fireman actually he’s cheated of his Fire Department he says that I should just wire it turn it on if it blows a fuse out of word wrong turn it off again wire it the other way and then turn it on in there be fine but I’ve read that you can think you have it wired right and then when you go to change a bulb you can get shocked if it’s not right and it may not blow fuse also both of the wires that come out of the fixture that came from the chain or both black with copper wires and both of the words that came out of my new old Chandelier has clear plastic with copper wires. Thank you please reply back as soon as possible! I am so happy to find this Post! I, like others, knew there had to be a way. I have 2 beautiful chandeliers and I’m moving where they won’t change the light fixtures. You made my day – thank you!! You are welcome! I’m currently redoing this project in my studio apartment in Seattle- it’s so helpful to add brighter light and so much charm! I absolutely salute your intrepid approach to diy, BUT, please take care, you are in an area where, from what I’ve read in the comments, you need professional advice, if you are unsure of the correct color coded conductors, or have only made off a handful of plugs before (or less), you are at risk of incorrectly wiring multi stranded cable, or extending cables incorrectly/unsafely, and in turn killing someone (dependant on the control measures in your consumer unit), but the current in a lamp can kill, make no mistake, please. I would recommend that you don’t rely on Google/YouTube and so on for your information, but find a friendly qualified electrician and pick her/his brains (the information on the Internet is just wrong, sometimes really really wrong). The issue that most concerns me is that though you may have a working lamp, it may fail in time and cause fire or electrocution, through either: unsafe connections, or incorrectly wired conductors etc. (based solely on your comments here, I’m not presuming on your abilities). Gas, electricity, structural works, if undertaken without experience and full knowledge , can kill, don’t underestimate this, people have, and they have on occasion died or killed others, this stuff has enough power to notch metal pliers, it is deadly, it’s that simple. Okay, preachy sparky done, good luck, all the best. Don’t speculate, get the right answers from someone qualified AND experienced. Great reminder! Persons should always exhibit an abundance of caution when working with electricity and seek professional advice if they are at all unclear about instructions or the particularities of the piece they are working with, however changing a lamp’s plug (essentially, what this project is) is a basic DIY project that our friends on more prominent DIY sites also promote as a safe project when appropriate caution is used. We have a friend who lives in a very old house. She wants to install a ceiling fan/light in a room which only has wall plugs. It is far too difficult for my husband to fish the walls and ceiling to do a hard wire job. Is it possible or even feasible to wire a ceiling fan/light that will just plug into a wall plug. While I’m confident the wiring could be connected to a plug and ran via extension cord to wall outlet, the challenge would be supporting the weight of the fan. If you are confident you can attach an anchor to a joist overhead, and are then able to securely mount the ceiling fan to the anchor, I’d guess this project could be successful. I have a ceiling light which I would like to convert to a pendant. How would I do that? Not sure, but that sounds cool! Can you post a photo? That might be above my skill level, but it depends on the light, I guess. If it has a wire or chain for hanging and you can extend that wire/chain, it *might* be just an issue of running the wires through a pipe and then buying fittings for the pipe on either end. I really appreciate how you made it step by step and easy to follow for an amateur. Mine turned out great thanks for your help on this project, I knew it was possible. Awesome! Thank you for letting me know it was helpful for you! Thank you SO MUCH for your very clear instructions and illustrations. I was just replacing the plug on the coffeemaker, but had no instructions for the plug. So glad I found you!